How does the forest change over time? You are here: Home / Classroom Stories / How does the forest change over time? A class of third and fourth graders walks along a forested path, round a corner and find a mysterious cement wall appearing out of large clumps of ferns and honeysuckle. Where did this come from? What story does it tell us about the people who once lived here? This group of students is exploring the Marsh-Billings-Rockefeller National Park (MBRNHP) with a forester solving the mysteries of the forest, the stories of people who once lived in this place. Think about the last time you spent some time walking in the woods. How did that make you feel? I have seen how even a little time in the woods can make anyone’s day go much better. 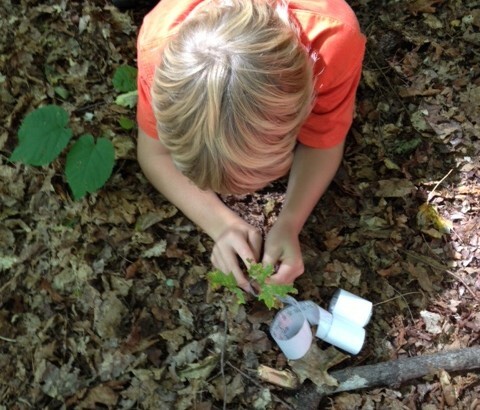 There are some inspiration teachers across Vermont finding meaningful ways to share outdoor learning with their students. This reading the forested landscape experience in Woodstock is one example. Cindy Siegler, third and fourth grade teacher at Woodstock Elementary School, finds meaningful ways to engage her students in outdoor learning in all seasons. This experience at MBRNHP is one small example of the work she does with her students. This is part of the Park Research program at MBRNHP, where educators are matched with resource professionals to help students do actually citizen science research in the park. The essential question students Cindy’s students’ research is, “How has this forest changed over time?” The experience includes reading the forested landscape and an outdoor laboratory researching forest succession by examining how plant communities change over time. This research activity was inspired by a Project Learning Tree activity, Nothing Succeeds Like Succession. The group visited King Farm, an adjacent property to MBRNHP owned by the Vermont Land Trust to look at the transitions from a mowed field to a forest habitat in a variety of 1 meter square plots. Students look at trees, shrubs, grasses, ferns, herbaceous plants, animals and animal sign, insects, decomposers, and topography. They compared results from various plots to see the changes in the landscape in a hands-on way. The shocking reveal came after students measured plots in a sugar maple stand with very large trees, a forest that looks like it has been a forest for a very long time. The forester asks the class, “Would you call me a liar if I told you this forest used to look exactly like the mowed field we started in today?” And then she pulls out a photo of the same hillside from 1907 showing that there were zero trees on that hillside. Student facial expressions at that moment demonstrate the pieces of a changing landscape falling into place in their minds. This is one example of a successful hands-on citizen science learning experience helping students meet learning objectives outside the classroom walls. Project Learning Tree, an award winning PreK-grade 12 environmental education curriculum, is an excellent tool to help design outdoor learning opportunities like this one for your students. Find out more about our curriculum.